I have decided to do a mini series of Photography Tutorials for y'all! It's so easy to buy a camera and dive straight into using AUTO (I've been there). AUTO is the simple way out of having to faff around with Manual or Aperture Priority mode. However if you have a lovely DSLR camera, surely you want to learn how it can work to it's full potential!? There are 3 components that are vitally important you learn about, before shooting with your DSLR camera on manual or Aperture Priorty. I am going to give you weekly tutorials to explain each of those components but today I am going to start with APERTURE. Understanding the principles and basics of photography will help you master your camera and give you that perfect photography you are after. I use a Canon 5DS, 50.6 Megapixel full-frame camera. Whatever make your DSLR camera is, these principles still apply! All light passes through your camera lens through a hole. This hole decides how much light to let onto your camera sensor. Aperture is the size of that hole inside the lens. Think how our eyes work, if you shine a light in your eyes your pupils will get smaller, but in a darker room they will dilate (becoming larger) to try and let as much light in as possible. The smaller the hole the less light that can pass through. Aperture is measured in F-numbers. This is the measurement of the diameter of the hole. This is where it got confusing for me to begin with, because the lower the f-number, for instance ƒ/1.4, the BIGGER the hole and therefore the more light that is allowed to the sensor. If the ƒ number is as high as f22, the hole will be smaller, meaning less light is able to pass through the sensor. Aperture is referred to as full stop f-number or f-stops. If you look at a lens you will see it has an f-stop range or number. The amount of light that reaches the sensor affects the depth of field and the amount of your image that is in focus. The lower the aperture, i.e. ƒ/1.4, the bigger the hole and the more light, which will give you a very shallow depth of field. Shallow depth of field means your object will be crisp and clear in the foreground with it's background all blurry. As the aperture increases, the hole gets smaller, the less light reaches the sensor, and the more in focus the background becomes. Shooting in Aperture Priority (shown as AV on most DSLR cameras) using a low f-number, will create the perfect for portrait, giving that person complete distinction from it’s background. As you can see the photo on the left the aperture is f/2,5 - creating a very shallow depth of field (making the second lemon blurry). The image on the right is f/32, which makes the background equally in focus as the foreground. Have a play with your camera on Aperture Priority mode. Put an object in front of you and move the F-number up one stop for each shot. You will then see the difference between the light and the depth of field. ISO plays a huge part with Aperture priority mode. I hope this tutorial was helpful, next up is ISO! Thank you for coming back to read about the next crucial part to learning how to use your DSLR! Today I am going to talk about ISO. The second principle in photography! 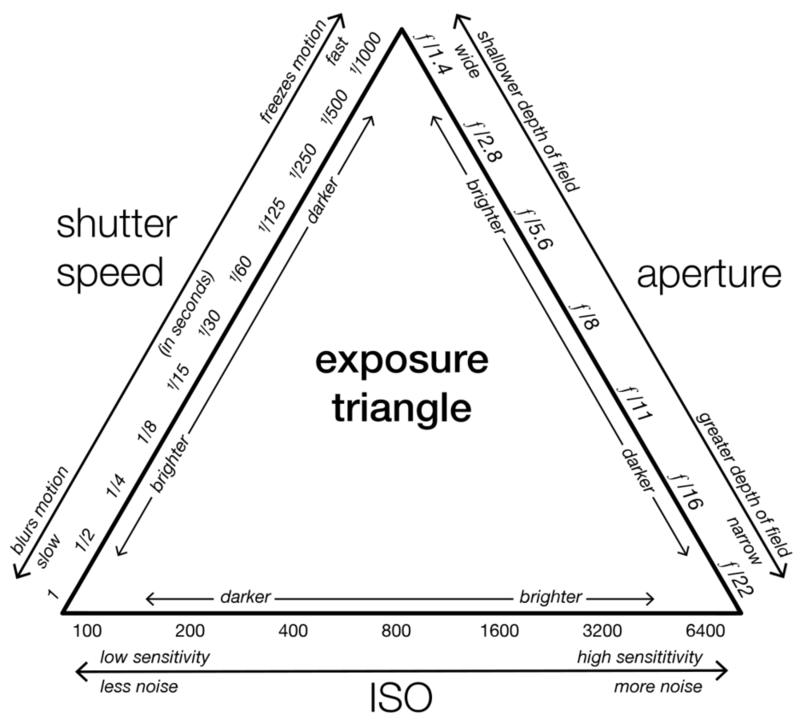 ISO measures your camera sensor's sensitivity to light. When your ISO number is lower, the less sensitive your camera is to the light. The more you increase your ISO number the more sensitive to the light it will be. The same principles apply as in film photography – the lower the number the less sensitive your camera is to light and the finer the grain. When you're outside on a sunny day taking photos, your ISO will most likely be at 100. However for darker environments, and poor light conditions, you would increase your ISO to say 2000. This will also enable you to take photographs without a flash. However, the higher you go with your ISO, the more grainier and noisier your image will become. I am one that quite likes a little grain and noise in my images, it adds and arty texture to the photos. As I have said before, each DSLR camera is different and with that so will your ISO scales. Most cameras base will be ISO 100 (my Canon 5DS is), this is normally the lowest setting. My canon's ISO then goes up to 6400 - which isn't too high, some cameras will go up to 25600. I think about ISO numbers as a scale low to high. Double the ISO, the sensitivity to light then doubles and the speed at which you take your photos doubles. If you shoot on ISO 200, it will be twice as sensitive to the light around you as an ISO setting of 100. An ISO setting of 100 will take 1 second to capture, when you double the ISO setting to 200, it takes 1/2 a second to capture the same image. Experiment with your camera, try and shoot a child running or bird flying. You will need to increase your ISO to around the 800 mark to take the photo at 1/8th of a second. 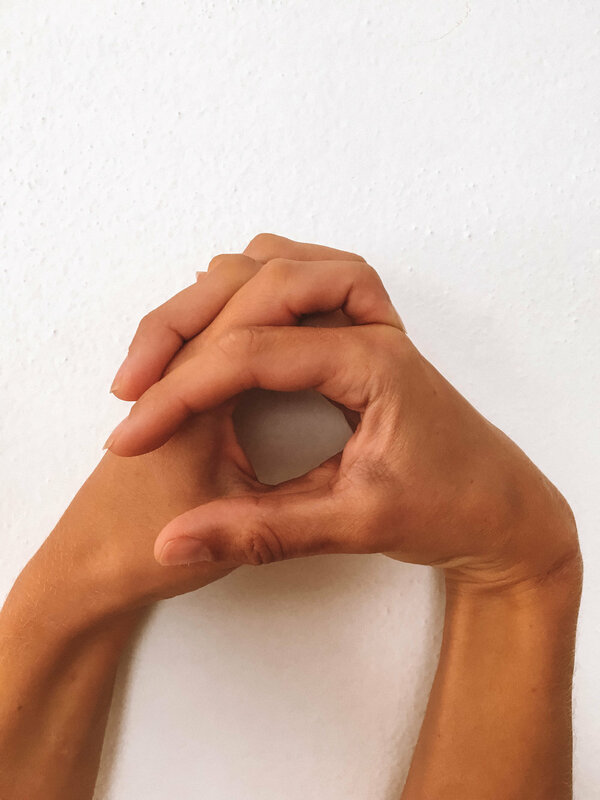 Although with this, you're increasing the camera's sensitivity to the light ( especially if it's a sunny day) and with that, it might mean you have a completely white shot! Have a look at my ISO cheat sheet below. Put your camera on Aperture Priority (AV) - remembering everything from my first tutorial and play around with your ISO outside. I hope this tutorial has been helpful! Up next is Shutter Speed, this is the last tutorial on the three principles to photography. Yay! This is the last component to my beginners tutorial to photography! Aperture, ISO and Shutter speed are the most important principles to photography and it's vitally important to establish the fundamentals of these babies. I promise you, it will help you become that photographer you wanna be! Okay, here we go.. the trickiest principle of the bunch (in my opinion).. Shutter Speed. Shutter speed is responsible for two particular things: changing the brightness of your photo, and creating dramatic effects by either freezing action or blurring motion. Essentially the shutter speed acts like a curtain, it opens to expose the camera sensor and the longer it is open, the more light that is exposed to the camera sensor. When you use a long shutter speed (1/60), you end up exposing your sensor for a significant period of time, which has a couple of important effects on your photo. Landscape photographers may intentionally use long shutter speeds to create a sense of 'motion' on rivers and waterfalls, while keeping everything else completely sharp. On the other hand, shutter speed can also be used to do just the opposite — freeze motion (for example: still portrait shot). Or if you use a super duper fast shutter speed, you can eliminate motion even from fast-moving objects, like birds in flight, or cars driving past OR even a drop of water being splashed in the ocean! To quickly summarize (without blabbing for too long) - shutter speeds freeze action, while long shutter speeds create an effect of motion when you photograph moving objects. The main button you press to take a photo on your DSLR is called the 'shutter button'. This button controls the opening and closing of the shutter, so just think back to your pair of curtains. You press the button to open the curtains. Okay, so here is the numbers part (which isn't my forte)! Due to Shutter speed being a 'length of time' (the curtains open and closing), it is therefore measured in seconds. When the shutter speed is less than one second it is measured in fractions of a second (hope that makes sense). If you set your camera to Shutter Priority or TV mode (Canon), you will be able to control the number of seconds the shutter is open for. 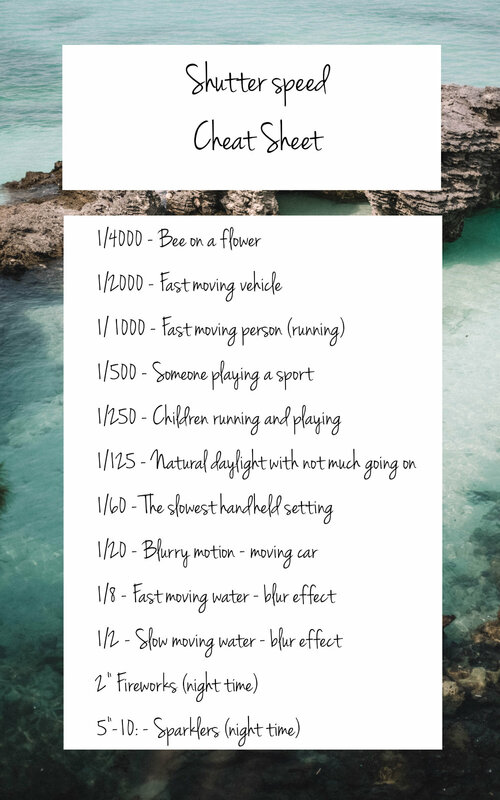 I use a Canon 5DS, and my camera allows me to change my shutter speed from the the fastest of 1/8000th of a second to the slowest setting of 30"
Have a play with your shutter speed, here is a cheat sheet below, to help you see the range of objects you can capture. In darker conditions you will need a slower shutter speed and therefore most likely need to use a tripod as the lower the light conditions, even the slightest hand jiggle will effect your image. In natural daylight on a clear day a shutter speed of 1/125th of a second will be just fine for everyday photos. When shooting on TV or Shutter Priority mode you also have control over your ISO. If you shoot on Aperture Priority the shutter speed will automatically adjust and you won't have to control it. I like to shoot on Aperture Priority (AV on canons) most days, but in darker conditions I always shoot on TV, so I can play around with the shutter speed. Be best friends with your camera. The best way to learn your camera, is to play around with it in different light conditions. Working with the three principles all the time. Okay, that's it from me today. Thanks for reading lovelies, I hope this has been helpful. I always embrace your feedback, so send me a message on Instagram if you have any thoughts or questions. Morning everyone! Thank you for stopping by to read my new blog post - always appreciated! Today I want to talk through the applications on my phone, the one's I use on a daily basis. The majority of the messages I receive on Instagram are questions about how to grow (this blog piece will come later), but also what applications I use to make my stories and instragram shot's creative. Most of you know I edit all my photos on Lightroom, this is primarily the only software I use on my laptop. However, there are a couple of other apps I dabble with. 5 Mobile Applications I can't live without! UNUM - This app is very similar to PLANN, however I use this to help with 'posting times'. It links to your live account and I find the timings incredibly accurate - way more than the Instagram business page in my opinion. I love the app so much - I've just upgraded to the Elite plan, where I can now see my stats on how many followers I gain and lose a day. Proper geeky! Ha. HYPERTYPE - Honestly, this app is amazing. You know how I get music behind my videos? This is the application..! The thing I LOVE most about this app is, they have an unlimited music choice, which you can add to your stories. You don't have to own the music - genuis! It also gives you a selection of many fonts and styles of writing. Unfortunately one niggle for me is, it would be great if you could create 1-4 stories in one go on the app so the same song runs straight through. Maybe there will be an update soon. You can however move the bar of music to link up to the previous story (if that makes sense).. It's time consuming. But it's worth it! TYPORAMA - Everyone seems to rave about this app, and I can see why. It has a vast selection of writing fonts for your photos, but also has professional photos you can use as a back drop. I use this app ALL the time on my stories. If you look at the sunset image above (my image), I uploaded this shot to TYPORAMA but I just wrote on top of it with their font. Super easy! RETOUCH - Okay... left the best app till last. This app is beyond amazing. I dabble a little on Photoshop, sometimes I remove a rubbish bin or a dirty beach, but it's always so much hassle and with all the layers you have to add, it can take a lifetime - especially if you're an amateur like me. With RETOUCH, it does that for you within SECONDS! You can 'lasso' 'erase' or 'remove' anything! Obviously if you are printing a large piece of photography, then this app probably doesn't work as well. However for Instagram (which compresses the image anyway) removing a scanky rubbish bin, or a person who's totally cramping your style .. it's perfect! That's all from me today, I really hope you enjoyed this quick read. Always love to hear your thoughts, so send me a DM!